Liability waivers can be a major obstacle to Boston injury lawsuits, but they are not always impossible to overcome. These waivers are often thrust in front of participants of certain recreational activities to warn of potential injury or even death. If you sign one of these waivers, it may limit the circumstances under which you are entitled to seek compensation if you are later injured. However, Boston injury attorneys can explain these documents are not impenetrable. There may be a number of challenges on which your claim can prevail. Unlike some other states where signing general liability waivers signed before participation are deemed void for public policy, the courts in Massachusetts have been willing to enforce many of these so-called agreements. It will take an experienced injury lawyer to successfully challenge it. In Sharron v. City of Newton, the Massachusetts Supreme Judicial Court (SJC) held these agreements are generally enforceable. The question was whether these so-called agreements were actually agreements at all. They are a type of contract, and a contract is a bargained-for exchange. Under contract law, a bargained-for exchange in one where both parties are agreeing to do something, or not do something, as a matter of material relevance. If only one side is incurring a detriment, it is called an illusory contract, which is not valid or enforceable. In this case, the court found the injured party was deriving the benefit of participating in the activity and the defendant received the benefit of getting paid for performing the service. This is not a great law in terms of providing injured plaintiffs with a full and appropriate financial recovery, but there are exceptions which we will discuss below, and you should discuss them with an experienced Boston personal injury lawyer. These types of contracts are drawn up for all types of activities, from rock wall climbing to scuba diving to horseback riding. The viability of cases involving waivers may not be immediately clear, but an injury attorney with in-depth knowledge of state statute and case law can provide you with valuable insight. According to a recent news article from CNN, airguns of various types are causing eye injuries to young victims in higher numbers than ever before. The number of air gun related eye injuries is up nearly 200 percent from years past. One thing to note is these are not classic BB guns. BB guns are of course dangerous and still cause eye injuries. However, Airsoft guns and paintball guns are far more popular. They are also used at facilities set up to provide those activities to paying customers. An Airsoft gun is an air or gas-powered gun that shoots a round projectile softer than a copper or steel BB, but still hard enough to cause serious injury to the eyes. A paintball gun, with which most people are familiar, shoots a gelatin-coated ball of paint and is powered by CO2 canisters in most cases. CNN detailed the ordeal of a boy who was injured by an airgun 10 years ago while participating in a paintball event. He was 12-years-old and at the time the youngest reportedly paintball eye injury victim. He was wearing the goggles as required by the rules, but they had been hit by a paintball so he could not see anything. He quickly removed the googles to clean them and at that moment, he was hit in the eye with a second paintball. His doctors tried to repair the damaged eye, but it was too damaged and they had to remove it and replace it with a prosthetic eye. He now has one eye and needs glasses to aid his other eye and thinks back often about his severe eye injury that occurred while participating in a recreational event. Today, Nerf guns are extremely popular and have been associated with an increase in the number of serious eye injuries from these supposedly safe projectiles. This is not say you will easily lose an eye when being hit by a Nerf dart, but damage to an eye is certainly a possibility. 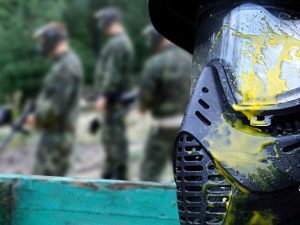 When a person goes to a paintball gun range they will almost always have to sign some type of waiver saying the center is not responsible for any injury that results from this activity. This is a problem, because as discussed-above, these waivers will generally be honored by the courts in our state. There is a however, a chance that the waiver went too far and that is where there are certain exceptions. One major exception is when these liability waivers purport to disclaim any future liability even for gross negligence of the staff and management. Zavras v. Capeway Rovers Motorcycle Club, Inc. In Zavras v. Capeway Rovers Motorcycle Club, Inc., another case from the Massachusetts Supreme Judicial Court, the defendant operated a track where dirt bike races were held. He required all participants to sign a waiver before participating. This waiver also purported to exempt the owner even from gross negligence. In this case, there were various jumps on the track. A rider approaching a jump had no way of seeing if the landing area was clear of other riders, so there was a flagman at the top of the jump who would signal to the rider whether it was safe to take the jump. When the plaintiff made the jump, he did not land safely and was on the ground. The flagman was not doing his job properly and kept waving more riders over the jump. Plaintiff managed to avoid the first two riders and then scrambled to get to his feet and get out of his way. As he did this, another rider was waived over the jump and plaintiff was hit in the head by the front tire of a dirt bike causing a traumatic brain injury (TBI). The defendant raised the affirmative defense that even if the flagman was engaged in gross negligence, the waiver prevented him from being liable. The lower courts agreed with this and granted his summary judgement in favor of the defendant, but the Supreme Judicial Court held that gross negligence was not excusable by making participants sign a waiver prior to engaging in an activity. The language of the liability waiver is key in determining whether the courts will honor the agreement.